Volunteers are the heart of our organization. Each year, they provide 13,000 hours of service that make it possible to open our doors to men and women living in poverty. People are driven to volunteer for many reasons and we look forwarding to getting to know each and everyone one of them. Prior to volunteering, prospective volunteers will attend an orientation provided by the Volunteer Coordinator. This process ensures that you have the best experience possible when at the facility. Following the orientation, the Volunteer Coordinator will help you sign up for your first volunteer shift! If you are interested in becoming a volunteer please contact our Volunteer Coordinator at 406-532-6674 or fill out our application here. Due to limited space, group sizes are limited to 10 people or less at one time. This ensures that members of your group are consistently busy while volunteering. We can accommodate larger groups with advance notice and special planning. To schedule a large group please contact our Volunteer Coordinator at 406-532-6674 at least two weeks in advance or fill out our application here. 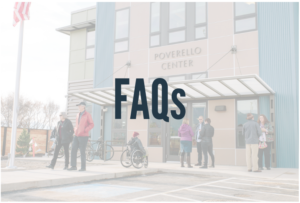 Click on the icon below to view frequently asked questions! PANTRY: This is the Pov’s version of a food bank. COMPUTER LAB: Help residents increase their knowledge of basic computer functions and applications. CLERICAL: Help with data entry, filing, and other tasks in the admin office. INTAKE DESK: Assist residents with mail, phones, messaging, and other basic needs. Host a seasonal supply drive! Make cards or artwork for our dining room. Knit warm hats or bring in adult outerwear during cold weather months — socks, hats, gloves, and jackets. Invite the Pov to do outreach at your church, school, or community event.